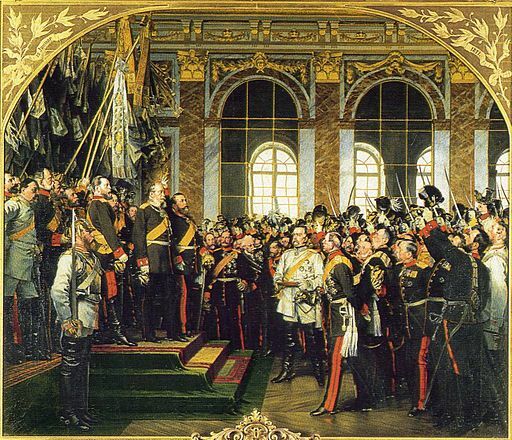 At noon on 18th January 1871 King Wilhelm of Prussia was crowned as the first Emperor of a united Germany, although the coronation took place in the Hall of Mirrors at the Palace of Versailles near Paris. The Franco-Prussian War of 1870-71 had been engineered by the Prussian Chancellor, Otto von Bismarck, as a means of uniting all the German states, which had previously been independent, to fight against a common foe and recognise the leadership of Prussia, which was by far the largest and most powerful of those states. Bismarck’s policy worked, although he did have a few problems getting King Ludwig of Bavaria to fall into line. Mad King Ludwig had spent much of his time building extravagant castles all over the place (a good reason for visiting Bavaria today!) but these had cost a fortune and Bavaria was deeply in debt. Bismarck had to agree to settle those debts before Bavaria would agree to join the German Empire. By staging a magnificent German ceremony in France’s most opulent palace, Bismarck was rubbing French noses in the dirt, and the snub was remembered years later when Germany was defeated after World War I and the boot was on the other foot as far as France was concerned. The heavy reparations demanded by France were a major cause of the ill-feeling that led to the rise of the Nazis and World War II, so it could be said that the consequences of the 1871 coronation had reverberations that lasted for many years to come. As it was, Kaiser Wilhelm, then aged 73, became the first German emperor and lived to the age of 90, guided in all matters by his wily Chancellor, Bismarck. On his death he was succeeded by his son Frederick, who might well have instituted a more liberal regime in Germany. However, he died from cancer after only 99 days as Kaiser, passing the throne on to his militaristic son Wilhelm, whose actions were to be partly responsible for the events leading to the outbreak of war in 1914. After Germany’s defeat in 1918 the German monarchy was abolished, having lasted for only 47 years.